'You can't link every Bengali speaking person to Bangladesh,' I&B minister of Bangladesh said. New Delhi/Dhaka: With the final draft of Assam's National Registry of Citizens (NRC) sparking a nationwide debate over the exclusion of over four million people, Bangladesh on Tuesday said that linking illegal migrants with the country was incorrect. During a telephonic interview with news agency ANI from Dhaka, Information and Broadcasting Minister of Bangladesh Hasanul Haq Inu said, "Everyone knows it is a century-old ethnic conflict in the state of Assam. In the last 48 years, no Indian government has raised the issue of illegal immigration with Bangladesh; the situation needs to be dealt by the (Prime Minister Narendra) Modi government in New Delhi, which is capable of handling it judiciously. It has no relation to Bangladesh." When asked if Bangladesh will be willing to take back the illegal citizens staying in India, Inu said, "As of now, India has not shared NRC findings with us and has not raised the issue. Until they do so, we will not speak." "You can't link every Bengali speaking person to Bangladesh," Inu added. 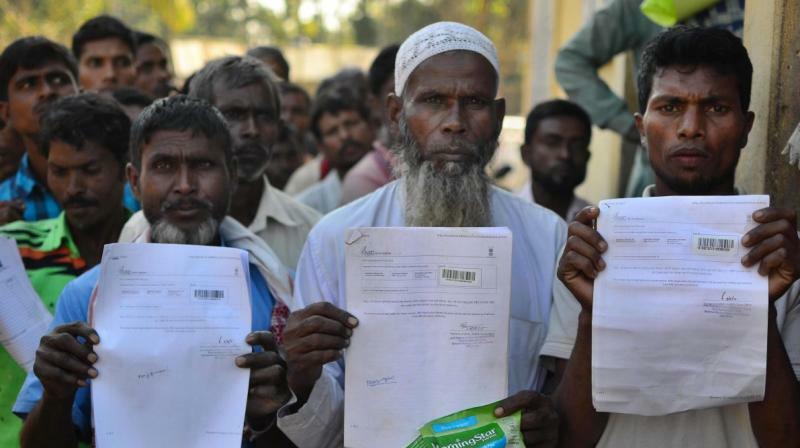 A full-blown political row has erupted ever since the final draft of Assam's NRC was published on Monday. The draft list incorporated the names of nearly 2.89 crore individuals out of the 3.29 crore applicants, leaving out more than 40 lakh applicants from the final draft. Earlier on Tuesday, amid the political slugfest, Trinamool Congress (TMC) supremo and West Bengal Chief Minister Mamata Banerjee slammed the Bharatiya Janata Party (BJP)-led centre, saying that the NRC was a politically motivated move by the BJP to get votes, adding that it could lead to a civil war. Meanwhile, BJP president Amit Shah stated that the NRC was a matter of national security and asked the TMC and the Congress to clear their position on the illegal Bangladeshi migrants living in India. He also charged the Congress party-led United Progressive Alliance (UPA) government of not showing the courage to identify and deport illegal immigrants from Assam as per an accord which was signed by erstwhile Prime Minister, late Rajiv Gandhi in 1985.